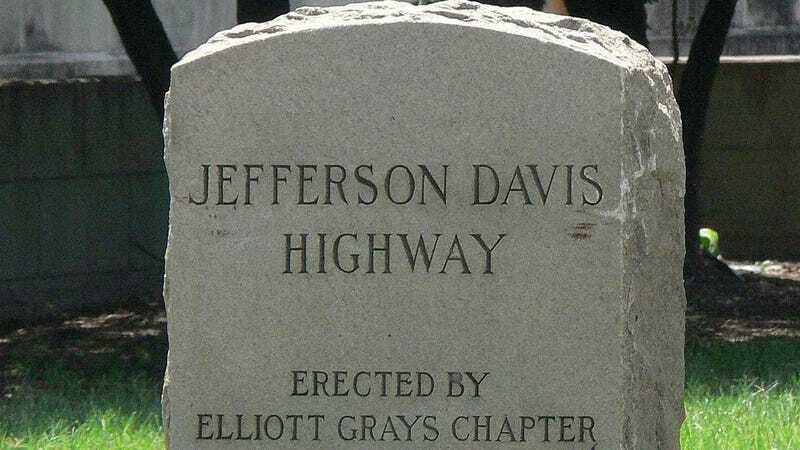 The city council of Alexandria, Virginia unanimously voted to rename Jefferson Davis Memorial Highway and have now set up a survey for public feedback and suggestions for what to rename the road. You probably have ideas. Alexandria’s decision to rename the highway that leads to Ronald Reagan Washington National Airport, Arlington National Cemetery, and the Pentagon was made in September of last year, and now people can send in suggestions. One of the people in our office has already suggested The Ayrton Senna Memorial Highway. Jefferson Davis Memorial Highway was sponsored by the United Daughters of the Confederacy in the early 20th Century in response to the publicly funded Lincoln Highway, and was originally intended to stretch from Northern Virginia to Southern California. Today, many stretches of roadway carry Jefferson Davis’ name, but this survey only affects the highway within the city of Alexandria. The Advisory Group assigned to the renaming process will make its final recommendation to the city manager on October 5. Click here to access the survey. It has fields for three suggestions and accompanying comments, but it would appear you can continue to keep submitting as many suggestions as you’d like until then. If you could name a highway anything, what would it be?